Uplifting dance pop and a Billboard Top 10 Hit with inspiring lyrics featuring her powerful vocals and first class production. An accomplished international singer/songwriter from Australia with an impressive debut on the Billboard Dance Club Charts in the United States, Jacinta is quickly becoming one of the music industrys most versatile and sought after talents. Proud to be a true and committed artist in the music world, Jacinta is a gifted musician, writer, vocalist, producer, and performer. Her music embodies dynamic beats, hypnotic vocals, and an overall infectious nature that captivates her audience. 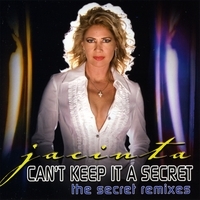 Jacinta co wrote Can't Keep it a Secret with legendary Tony Moran (Dianna Ross, Beyonce) and his production partner Warren Rigg.